BAYTOWN, Texas -- A popular pizza delivery chain is working to raise money for the family of fallen Precinct 3 Assistant Chief Deputy Clint Greenwood. 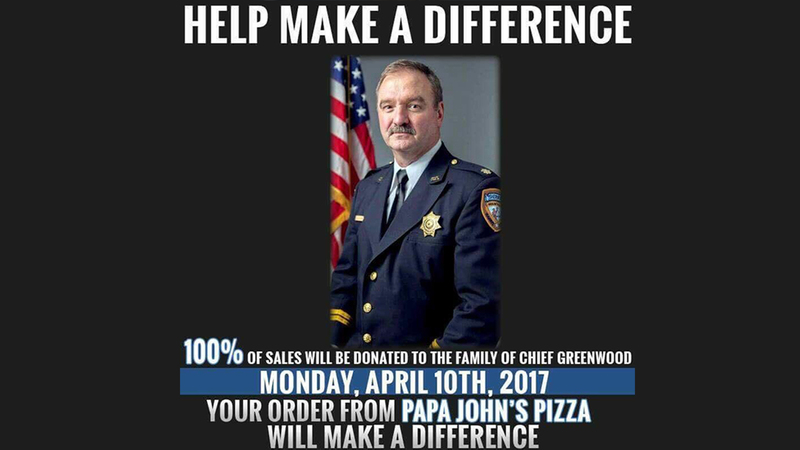 On Monday, all proceeds from the Papa John's locations in the Greater Houston area will be donated to Assistant Chief Deputy Greenwood's family. That's 100 percent of every dollar from every order tomorrow. That's exactly one week since Greenwood was ambushed and killed after arriving to work. The killer had scoped out the location of the attack the day before. Investigators have interviewed several people, but have made no arrests. There's a $65,000 reward in the case. Anyone with information is asked to call Baytown Crime Stoppers at 281-427-TIPS (8477) or text keyword "Baytown" plus the tip to 274637.